Disclaimer delidding is a very dangerous process! Only delid if you truly believe you are ready after reading and watching and viewing all the necessary materials that apply to delidding and getting all necessary equipment ready as well! MOD NOTE: Delidding your CPU does void its warranty. If you RMA the chip it is classed as RMA fraud, please do not discuss such actions in this thread or anywhere on OCN. There is a new way to delid! so go share some love at these guys's home and come join the Official Club here! Hey guys! Two days ago I posted saying "YOLO, going in the vice now". Within 5 minutes of posting that I was done. I have some tips for and info on the vice method for people who have never done it, or are still afraid of this method. For the record, I successfully delided my 3770K with a THICK box cutting razor. There was not a scratch on the PCB, and it took me all of 5 minutes. I'll admit I was careless, but I'm damn good with my hands. For those that don't want to buy a Vice, or think that the razor method is cheaper and safer, THINK AGAIN! Two days ago I bought a 4" Drill Press Vice from Lowe's for $19. The Part number is BV-DP40. This is probably the best vice for the job. And for all you people who don't want to drop $20 on a vice just to delid, Lowe's has a 90 day return policy! I don't feel guilty about returning the vice because: 1. The box is in perfect condition, 2. The vice jaws were covered in blue painters tape to protect both the jaws, and my IHS, and 3. The vice has not a scratch on it, and was never bolted to a bench/ table. So after you're done, return it! 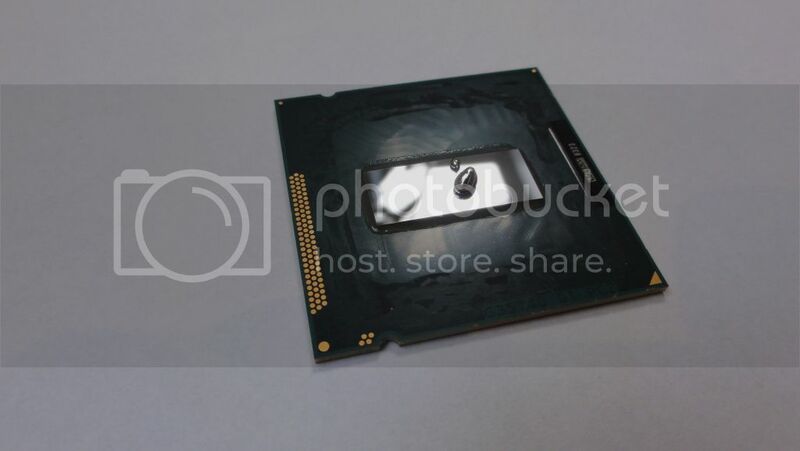 That's a free delid folks. Here's the vice I used. It's 30 on amazon, but only $19 at Lowe's! And at Lowe's you have 90 days to return it. Onward. Here's how I positioned the vice. The operation was completed on my kitchen counter. I have a board underneath the vice to protect my counter, and a board held vertically behind the vice that serves two purposes. 1: To protect my kitchen counter molding, and 2: To give the vice a solid backing, since all of the force will be directed that way. With this setup, the vice will not move, and will be just as secure as if it were bolted to a work bench. Now for the positioning of the IHS in the vice. I haven't seen this discussed much so I'll add my suggestion for how it should be placed. For Haswell, secure the IHS in the vice so that the VRM side is facing you, meaning you will be hitting the VRM side with your block. Why? Because this minimizes the risk of both the VRM's and the Die itself from hitting anything after it is free of the IHS. 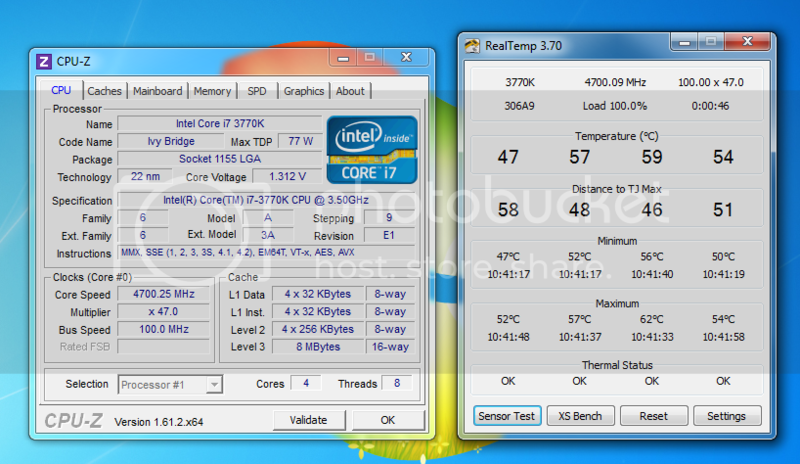 Take a look in my pictures at the layout of the 4770k after I crack it open. You'll see that the side of the chip which has the most clearance between the die and the edge of the PCB or IHS is the side opposite that of the VRM side. You want to hit the VRM side because once your chip is free it will move forward, and when oriented this way your VRM's and die are furthest from the threats they are approaching. For Ivy, just make sure your vice is clamping the flanged sides of the IHS, this will allow the most safety clearance for the die. Phew that was a lengthy explanation for such a simple concept. 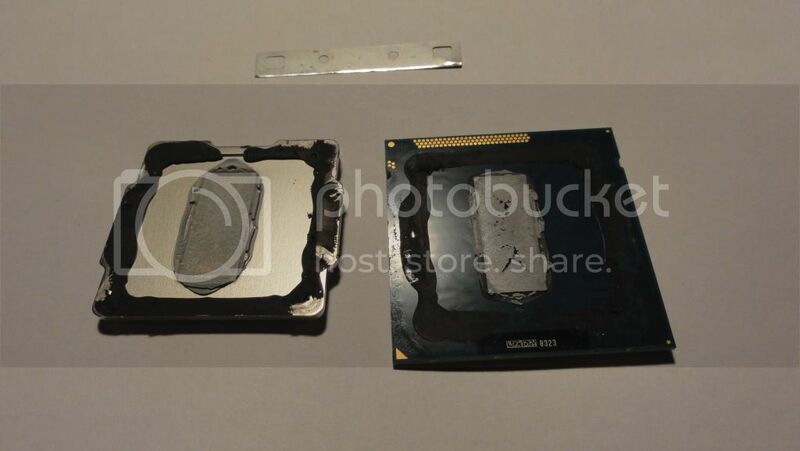 Here's an example of how a 4770K/4670K should be clamped. Now for what material your hitting block should be made of. PINE. That's it, no other woods, don't even think about it. Pine is soft enough to not damage the PCB, yet strong enough to break the seal easily. Use a section of 2x4 (Two by Four) with nice square edges. I'd recommend a length no shorter than 8", and no longer than 14". The shorter the block, the less force it can absorb meaning the PCB will take more brute force. Too long, and it may become difficult to hold and control. Now hold the block, with its clean flat and square side, directly parallel to the PCB. Apply pressure towards the PCB with your hand, this eliminates the chance of the block slipping off, or a slapping effect on the PCB which we DO NOT WANT. Hit the thing, hard. However technique is also involved in this stage. When you're hitting a nail, you swing hard and follow through; the point being to drive the nail with the follow through of your hammer's blow. This isn't the type of swing you want. We want concise yet powerful taps, no follow through. If you hit the PCB with a full blown nail driving follow through, you'll send it flying. Bad. So to reiterate: Strong, yet controlled and concise hits. Your PCB should be free in a few hits, and it shouldn't even go flying if you follow this technique. When I did mine, the PCB broke free and rested right on top on the IHS, no drama whatsoever. After the PCB was free I inspected the edge that was hit. It was immaculate, not even a micro-scratch or dent to be seen. My block of wood (2x4 cut in half laying in my garage, PINE) took all the force. You can see here how the block fared afterwards. This proves that the PCB is much stronger than pine. As for cleaning off the glue, I've heard some people complain saying it's hard to get off. >_> Get real. Use the corner of a credit card and scrape it off. Scrape as hard as you want, I promise you the plastic your card is made of WILL NOT scratch the PCB, even if you tried. In conclusion, I've done both methods. Use a vice. It's safer, its faster, and it can even be cheaper if you have no qualms about returning your $20 vice. Hope this post wan't too long, and that it helps some of you out. Happy deliding. I'll post my results and validation here in a few minutes. YOUR HASWELL CAN BE DELIDDED AS WELL!! As you can see the caps are on the same side as the line of gold pads... so you NEED to start the cut on the opposite corner to keep those caps safe for the initial cut. There will be a few things first off that I need to get out of the way for this. I want this club to not only show what we have done through our time and effort but to be a helpful club to others and direct them to the right people on how to properly delid and get the information out their now so no one makes any mistakes! Now, I hate to say this but we have had chips die in the past and this is what can happen if you aren't ready and fully prepared! However He was very lucky and fortunate to have that chip still work. Ivy Bridge's are tough, but not invincible! Now for the real reason your Ivy Bridge runs hot. Very interesting results from a very good delid test of deliding and TIMs on an anandtech forum thread where the OP Idontcare found that the IB temp problem was not from the intell TIM at all, but from the gap between the die and IHS. And if we remove the paper shim and drop that IHS down onto the CPU (not perfectly zero of course, there is still some NT-H1 CPU TIM there after all) reducing the gap to as close to zero as possible then we get the "c" cases...and the temperatures show the expected fantastic drops we have all come to expect from delidding our Ivy Bridge chips. >>>>> Surprising also was his finding that direct die to HFS did not help to reduce temps as much as he had thought they would. The take home message there is replacing the CPU TIM doesn't really provide any benefit. Reducing the gap between the CPU and the IHS does. And removing the IHS entirely doesn't really provide much benefit either. Unless you have a custom loop and everything is set up just right then your results can really shine. but it takes time and practice for more information ask SonDa5. And that stands to reason. The heat is going to flow through the copper of the IHS the same as it does through the copper of the H100 waterblock. But if there is a thick pad of thermal paste in the way, as was the case with my 3770k at time of purchase, then it doesn't really matter how good the TIM itself is (unless it too is made of metal) because the mere presence of that thick pad of thermal paste becomes the weakest link in the thermal conductivity equation. Once you eliminate the bottleneck that is the gap between the IHS and the CPU, or if you happen to end up with an Ivy Bridge CPU which doesn't have much of a gap to begin with (Yuriman ), then you have pretty much optimized the system at that point regardless which CPU TIM of choice you employ and regardless whether or not you leave the IHS in place. Now the choice of CPU TIM still plays a role in terms of the robustness in maintaining those nice low temperatures. If the so-called "pump out" effect is real then we can expect it to bite us unless we choose a substitute CPU TIM that is designed to avoid such thermo-mechanical effects. I haven't really got into testing that part out yet, but I expect IC Diamond and the metal TIMs like Liquid Ultra to be key there. These blades and knifes have been specifically chosen by us the Delidded Crew to help you guys have the best chance at successfully delidding your chips. WE TAKE NO RESPONSIBILITY FOR THE MISUSE OF THESE BLADES AND PERSONAL HARM OR DAMAGE TO YOUR CHIPS. Most of these can be gotten from a hardware store. Here is a list of CPU's that should be able to be delidded and some are very cheap so great for saving your chips. So I'll explain what this means quick as well. what that W/mk means is this. It's the absorbance and moving of heat that the TIM or Thermal Interface Material can move from place to place. As you see Liquid Pro is at 82 and AS5 is at basically 9. So this means that you get 9 times the heat movement by using Liquid Pro over AS5. If you need a better explanation of this just PM myself. Now for the requirements to join the club are as follows. Post a picture of you delidded chip and write your OCN name on a piece or something of the like. For those already running delidded chips and don't feel like taking them out and re-installing I understand so take a picture that you most likely took when you delidded it and use what every program you'd like to put your name somewhere on the picture. For the layout of the chart and what I want for submissions to be accepted. You must submit your temp drop by following this format for research! For the submitting process of your temps use the following rules. 4. Report your HIGHEST temp from your four cores. This is also for people looking into Delidding and seeing just how crazy their temps can decrease by Delidding. The trick is to start a bit more to the back when placing the IHS back, i think about 0.5- 1mm will do..
the stub holder on the side of the socket. which in turn forces the CPU down tightly on the landing pins. so you have to get it right, before the lever is under the stub.. I have a vision of a brilliant master mind Ivy Bridge Intel engineer smiling when an IB is delidded in the pursuit of performance. Having access to the bare die of IB is a special gift and if the IB IHS would have used fluxless solder like SB we would not have been given the opportunity to easily access the bare die of IB. The benefits to have freedom to cool the bare die of IB may be greater than the design of the SB IHS with fluxless solder. This is real modding and it is very rewarding. Might I suggest we add that you have to state which TIM you used under the IHS? I'm just making sure is all lol not going mod here at all I'm to crazy for that lol. I like this! Edited my post.